We'd visited the Wild Dog Winery a couple of times before and eaten there once before, it is perched in a beautiful spot in the rolling green Gippsland hills, just south of Warragul. 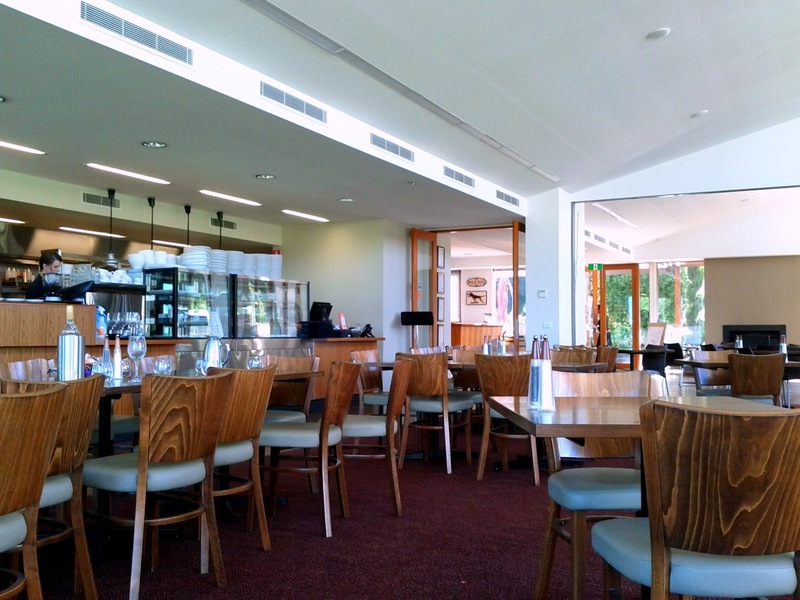 The interior is bright, airy and spacious, the carpeted floor prevented it becoming echoey, it was fairly busy when the four of us arrived on a spring Sunday lunch time, with a couple of largish groups as well as plenty of smaller tables. The menu offered a couple of degustation options, but we decided to select our own dishes, however it was a little tricky working out how much/what to order as the dishes were grouped into sections charcuterie, sea, meat and earth with items of differing sizes hard to identify. The waiting staff weren't able to easily explain of suggest things either. In addition the pizza's on the website menu were on offer when we visited. In the end we decided to share two items from the charcuterie section for entree, which with some extra bread worked out well. The Spanish chorizo pan-fried with tomato came with slices of toasted bread. 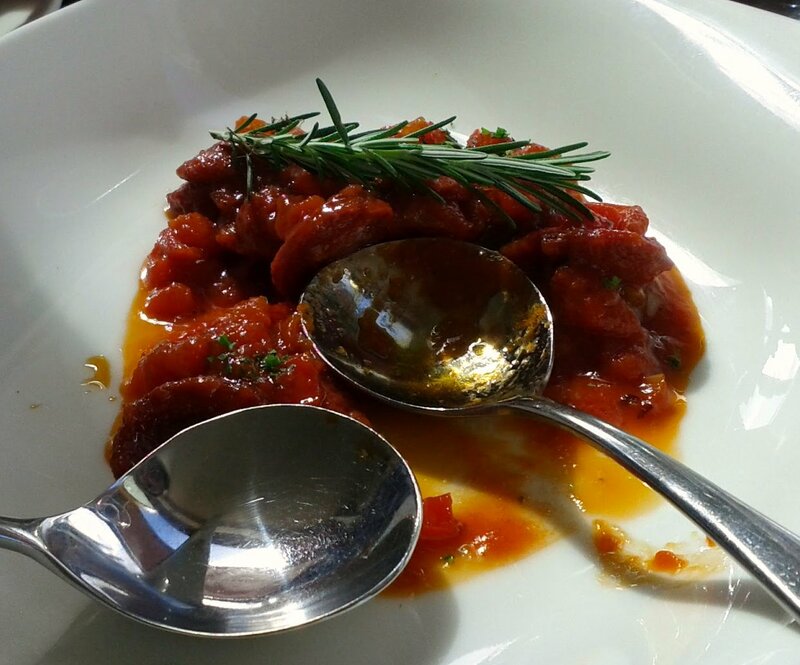 The combination of flavours was suitably Iberian, the tomato based sauce being a particular highlight. 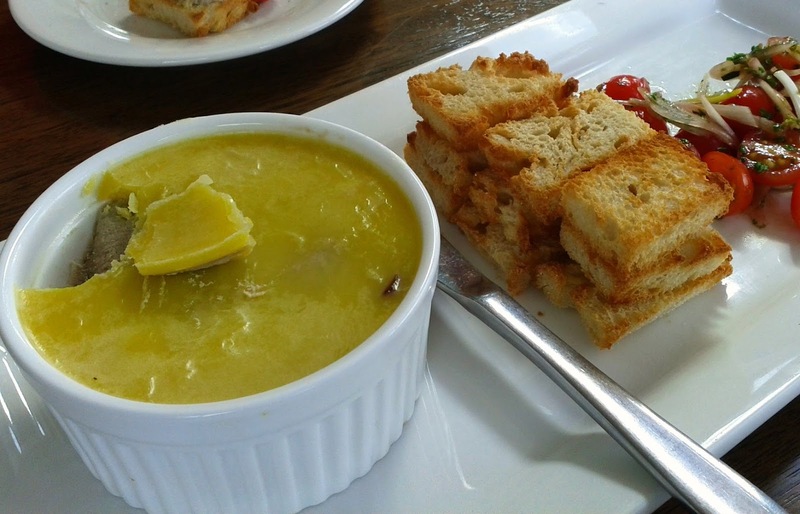 I don't often eat Chicken liver pate these days, not good for keeping the cholesterol under control, but this carefully presented dish reminded me what I've been missing. We had a long wait after the first dishes came out before our 'mains' came out, we were relaxed, but too much time passed with only extra bread offered to go with our entrées and a brief explanation of a busy kitchen from a waitress. 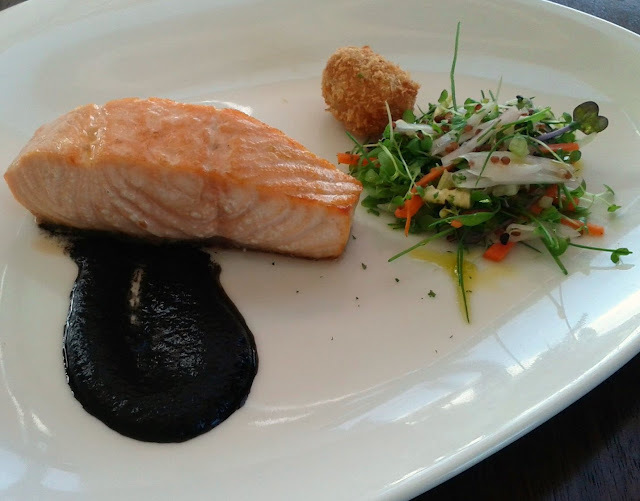 The pan fried atlantic salmon fillet, was served with highly praised squid ink, a smoked eel croquette and a micro herb salad. 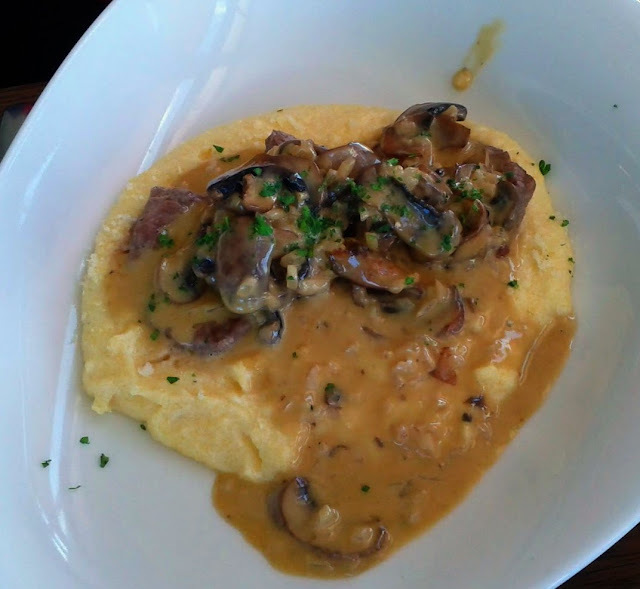 The milk fed veal scallopini came with portobello mushrooms and a garlic, wine cream sauce and polenta. 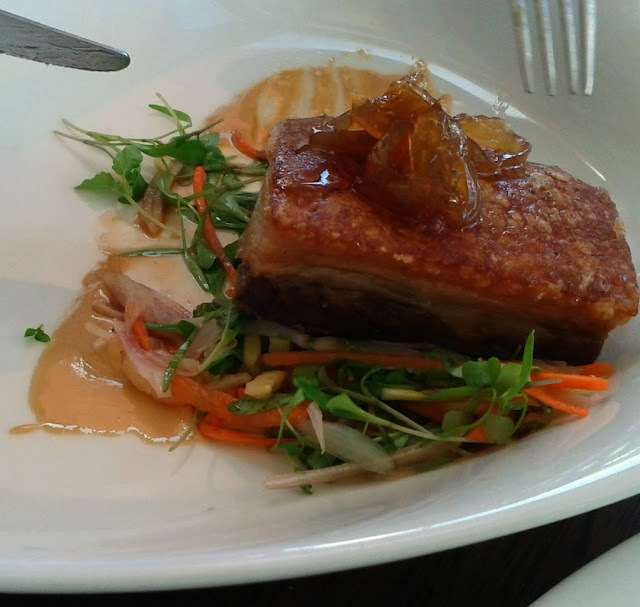 The Gypsy Pig pork bellie, micro thai salad, espuma, black sesame rice crisps looked wonderful. I ordered the King George whiting, but was initially presented with the King fish dish, a much lighter affair accompanied with Tasmanian shima wasabi, pickeled shallots, radish, watercress and lemon oil. The waitress apologised and let us have the extra dish on the house, it was interesting and great to share and try, but I'm not sure I would have been happy with it as a main. 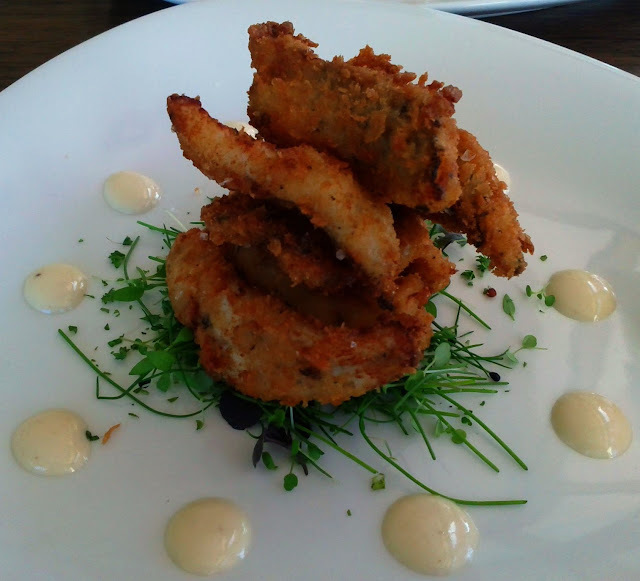 The whiting was crumbed and came with tarragon, lemon pepper, lemon and aioli. 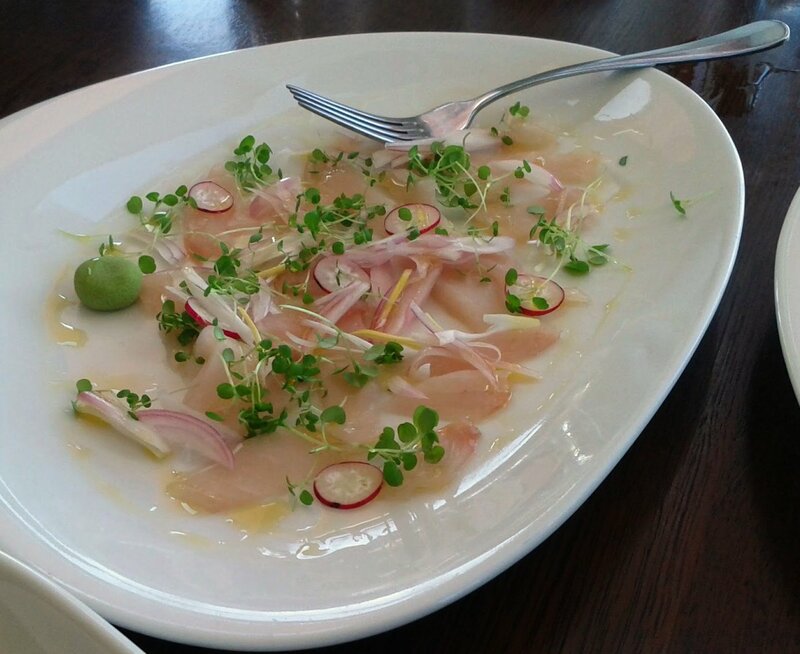 The fish was perfectly cooked and the dish was more filling than it initially appeared to be. As sides we shared a couple of 'Earth' dishes between the four of us. 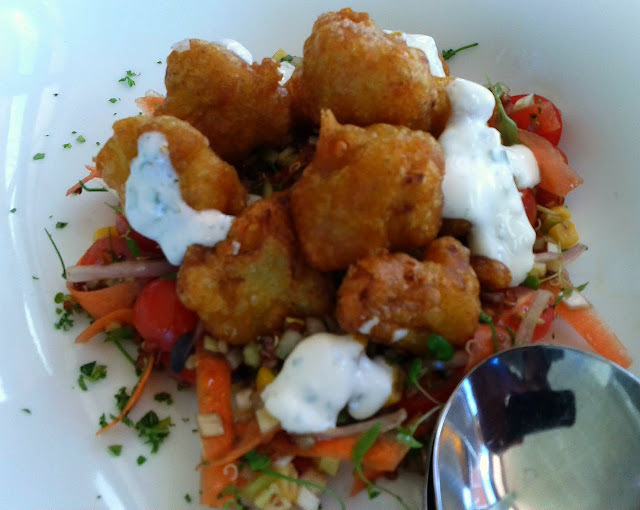 The curry beer batter cauliflower with onions, tomato, greens, quinoa, balsamic and yoghurt.was an interesting and well executed combination, I was left wanting more of the cauliflower! 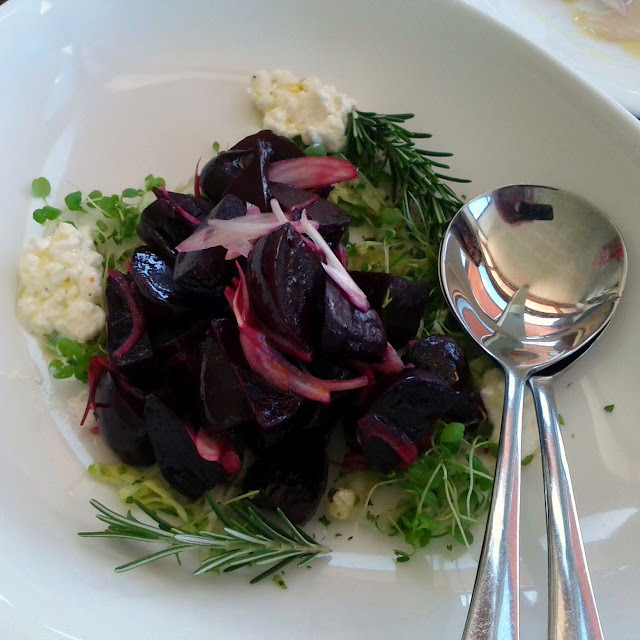 The house smoked beetroot, was another taste sensation I hadn't experienced which left me wanting more! It came with chopped greens and cottage cheese. Overall the food was great, the only downside of the whole experience was the long wait and the mix up with the my main.The bill came to around $190 for the four of us including a bottle of Wilddog Riesling, a few glasses of the Pinot Grigio, a beer and some coffees, not to forget the Noojee Num Num!